Staff Correspondent: After completing B.Sc Engineering from Electronics and Telecommunication Engineering department of North South University, the young entrepreneur Engr. 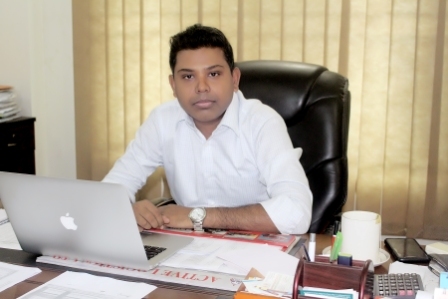 Imran Kader Turjo has taken the responsibility of Managing Director of Southern Knitwear Limited— a 100% export-oriented RMG manufacturer in Bangladesh. The company was founded by his late father Engr. M. A. Baset. Mr. Turjo received special trainings on Leadership and Project Management from ESI in Singapore. The Apparel News: How did you start the profession? At the young age, you are serving as Managing Director of a large business organization like Southern Knitwear Ltd. How do you enjoy the responsibility? Engr. Imran Kader Turjo: Before telling the beginning of the profession, I first tell my educational background. Academically I’m an engineer, but technically I have not had the chance to apply it. Because, after completing graduation in engineering, I started my professional career here as an Active Director in 2010, under the direction of my father, the then Managing Director of Southern Knitwear Ltd. From 2010 to 2016, I operated all kinds of activities in the factory, then I became intimate with this profession, which later became an important part of my life. After the death of my father, I took over the responsibility of Managing Director of Southern Knitwear Ltd with the full cooperation and inspiration of all other directors. Occupation, professionalism and business- I enjoy everything in the workplace. The Apparel News: Your father late engineer M.A. Baset has founded this organization with his labour, sweat and talent. How do you evaluate your father? Engr Imran Kader Turjo: My father late engineer M.A. Baset was a student of mechanical engineering at BUET. During the student uprising in 1969, he performed some important duties. The beginning of his life was very challenging. He had crossed many ups and downs in life. In the career, he spent a lot of time in Jamuna Group. When he joined Jamuna, only Jamuna Electronics and another project were going on. After his appointment, Jamuna Fan, Pagasus Shoes, Jamuna Distillari, Jamuna Knitting and Dyeing, Jamuna Garments, Shamim Spinning Mills, Aromatic Cosmetics - these projects got institutionalized form. Under his supervision, the Spinning Mill with highest Spindle was introduced in Bangladesh in 1995. He served as Director at Jamuna Group for a long time. Later, he shifted from Jamuna, and established ‘Knit Asia Ltd’ during 1999 to 2005 with the association of Mr. Matin Chowdhury—the then President of BTMEA. My father M.A. Baset used to take any challenge without any hesitation. “It cannot be done”, there was no such word in his dictionary. His name was memorable in various development activities of BKMEA during the period of 2005-06. He served as the Director and Vice President of BKMEA for a long time. In 2006, he established Southern Knitwear Ltd. The Apparel News: Tell about the business success, potential and affordability of Southern Knitwear Ltd.
Engr Imran Kader Turjo: The company’s journey started with a 200-300 workers in a rented building in Kanabari of Gazipur. At present, there are about 2,000 apparel workers in the company. With the help of efficient and old management, executives’ efforts, mutual cooperation, and good understanding with each other, Southern has been advancing day by day. The Apparel News: What has worked behind your company’s success? If you would say about the future plan. Engr Imran Kader Turjo: The main thing behind the company’s success is the unity and accountability of our management. I don’t even think myself out of accountability. Management officials poured their maximum ability. And so, on the basis of them, we are making a projection of large-scale dyeing projects and spinning mills. The Apparel News: Tell us about the products and services of your company. Exported to which countries? Which brands are buyers of your products? Engr Imran Kader Turjo: SKL makes knit garments for 100% exports. We make apparels for many renowned clothing brands of the world. Lion part of exports are done in many countries of Europe and America. Besides, some of our garments are exported to Australia, Japan also. The Apparel News: Owners often say that they are not getting skilled manpower/workers. What is your experience and opinion in this regard? What is your recommendation to create skilled human resources? Engr Imran Kader Turjo: It cannot be said that skilled human resources are not in our country, but we have not been able to build enough skilled human resources yet. In other countries, helpers are less recruited in factories. The awareness has not yet come to our country. More than 40% helpers are still used in Bangladesh’s RMG sector. For this reason the cost of the factories is increasing. By 2021, there will be a need for 36 lakh 60 thousand skilled garment workers in the country. BGMEA research institute ‘Centre of Excellence for Bangladesh Apparel Industry (CEBAI)’ has been working for nearly three and a half years to develop skilled workers by giving them training. The renowned clothing brand H&M is providing support to the International Labour Organization (ILO) in this regard. This training is going on in different factories. Besides, BKMEA has taken many such initiatives at different times. I think that this type of training project should always be going on. The Apparel News: Tell us about the goals and objectives of your company. Engr Imran Kader Turjo: Our goal is to create a fully environment-friendly factory by extending all facilities to the company’s employees by maintaining a nice, cooperative environment. The Apparel News: How is the future of Bangladesh’s ready-made garment industry? In your opinion, what are the challenges ahead for the industry? Engr Imran Kader Turjo: After the collapse of Rana Plaza, the Accord and Alliance started various audits keeping fire safety, housing security, electric security in mind. Factories are spending a lot of money due to their audit activities, which are not possible for all factories. So many small factories have been closed. But for those who have completed these compliances, their buyers have a good marking on them and has a commitment to give them better business. So the future of Bangladesh’s garment industry is very bright in my eyes. The Apparel News: We know that many foreign designers/professionals are working in Bangladesh’s garment industry, especially Sri Lankan and South Indians. What is the position of our local designers in the fashion industry? Have you got any initiative to create your own designers? Engr Imran Kader Turjo: We came to know from the Bangladesh Bank and RMG Industry people that Bangladeshi workers are far behind in the field of skill compared to India, Vietnam and Pakistan in the garment sector. For this reason, we are hiring foreign experts in our companies at different levels. They are sending more than 500 million dollars of their earned money from this country to their home countries. If we can be self-sufficient, then this huge amount of money can be left in our own country. If this can be done, the role of garment industry in the country’s GDP will be much more. I think it is very difficult to make such an expert or a designer for a factory alone. However, apparel companies all together can take the initiative. The Apparel News: Which affairs should be cared off to keep Bangladesh’s dominance in RMG export market for at least next 20 years? Engr Imran Kader Turjo: I believe that Bangladesh’s dominance in the world clothing market will not only continue for only 20 years, but it will continue for a more. Millions of garment workers are working in this trade and it is the main source of earning foreign currency. The Apparel News: Please tell something to them who are involved in garment industry, especially those who are the clients of your products and services. Engr Imran Kader Turjo: Our main goal is to provide a safe and beautiful environment for those who work in the factory and ask them to take all effective steps for the development of factories. And from our buyers we expect the fair price of apparels for ensuring the living standards of the workers. The Apparel News: Who has inspired behind your success? In what position do you want to see yourself in the future? Engr Imran Kader Turjo: I came to this business by the motivation of my father. So he is my first inspiration. Besides, self-confidence and patience are the two sources of my energy and motivation. If I can move ahead with the calculation of my mind, then I think that success will definitely come. In the future, I want to see myself as a Successful Businessman.